If you haven’t read the previous section on bicubic spline interpolation, now would be a good time! This leaves us with a total of 16 values to solve for in the case of generalized bicubic interpolation, as opposed to the 4 needed with 1D cubic spline interpolation ( and ). I also mentioned in the previous section that bicubic spline interpolation is a special case of generalized bicubic interpolation. For the former of the two, we simply carried out 1D cubic spline interpolation along each axis and we were done. We aren’t making use of all the data available to us though, such as the cross-derivatives. For each of the neighbouring 4 data points, we need to know its intensity value ( ), its partial derivatives along both axes ( and ), and finally, its cross-derivatives ( ) before we can proceed any further. Before we proceed these, we need a coordinate system, as always. 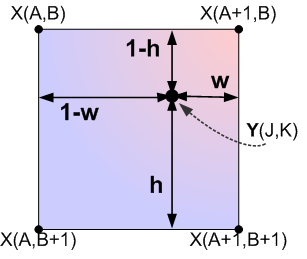 Notice how we now need to know the values of (1-h),(1-w), etc, whereas when we carried out bicubic spline interpolation we didn’t! If the spacing between pixels is not equal (ie: you are only carrying out interpolation on part of an image rather than the whole thing), you will need to adjust the denominator values in the above equations. Note that even if you get these values wrong, the final result will still be smooth, just not as accurate! Note that the refers to the transpose of these matrices, rather than an exponent (which would only make sense for a square matrix anyways). With these equations, we can use our favorite method (feel free to pick) of solving this set of linear equations to solve for the inverse of our weighting matrix, . 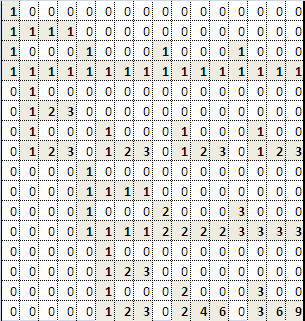 Once this is done, we can save this matrix for use in any future implementations of bicubic interpolation, as there is no need to recalculate it again in the future. By simple matrix inversion (yes, you can do this by hand if you really want to, the matrix algebra is very simple, just time-consuming; it’d be better to do this with MATLAB), we get the inverted coefficient matrix, . 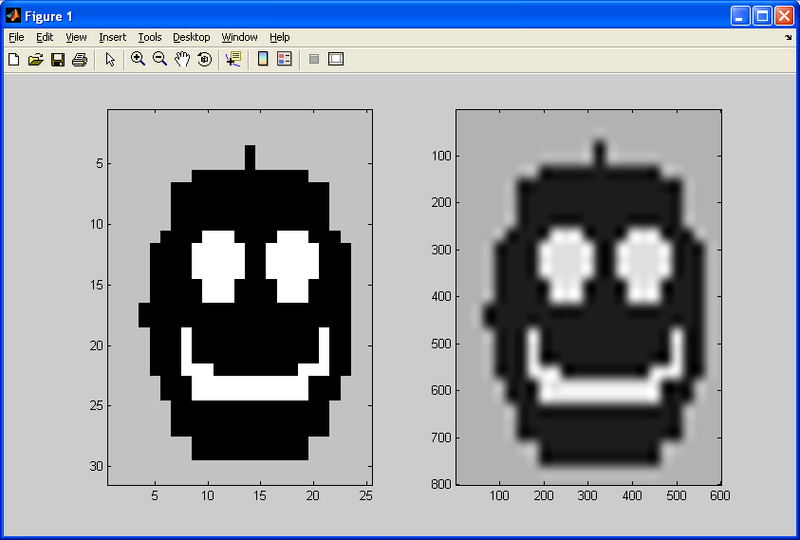 %pixel in the source image, be my guest. %I won't go over it right now. 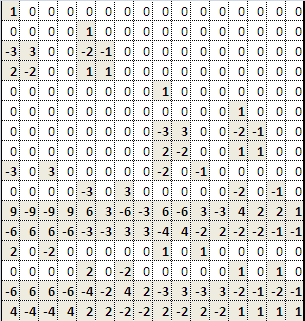 Included below is a simple resampling of a 4×4 checkerboard pattern to a much larger resolution using the code above. Before concluding this section, I should note that there are many other resampling methods that are definitely worth reading up on, such as Lanczos, Hermite spline, Super Eagle, 2xSAI, HQn, and so on. Many of these algorithms are used in commerical products such as image processing software digital cameras, even console emulators. I will now conclude this section with a brief comparison of “bicubic spline interpolation” and “generalized bicubic interpolation”, and will show why the two are NOT the same. If we observe the resampling smiley faces, we can see that both still have halos introduced due to our choice of resampling algorithms. One important difference exists between both of the sampled images, however – the former of the two (generated using bicubic spline interpolation) still demonstrates some sharp edges and even corners, while the latter does not. This is due to bicubic spline interpolation being a rough approximation of generalized bicubic interpolation at best, primarily due to it not making any use of the cross-derivatives of the source data. 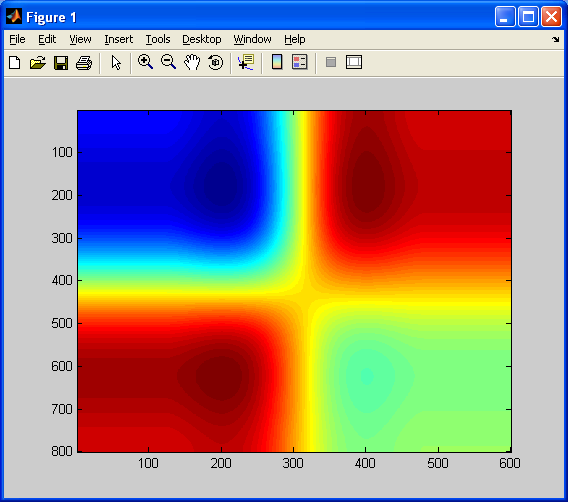 Numerical recipes in C the art of scientific computing. Cambridge: Cambridge UP, 1992. Print. Thank you for the help with this. I suppose that x_scale and y_scale should be a ratio of either (dimensions) or (dimensions-1). In your code they are dimNew/(dimOld-1). 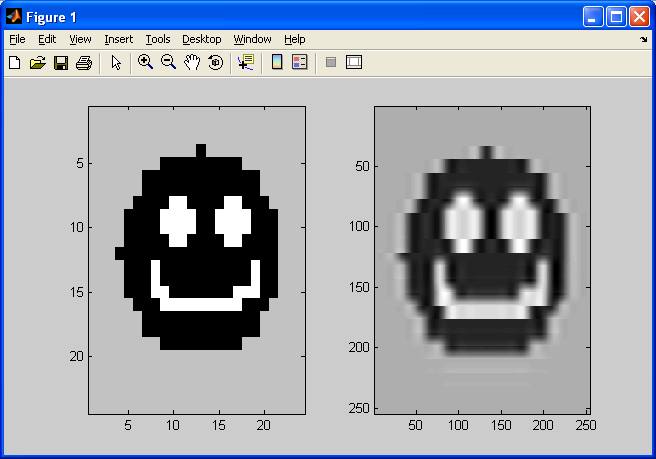 Check what happens if you keep both dimensions the same – in your case pixel values change, although they shouldn’t.